I just came back from an enjoyable beercation (a vacation with the purpose trying beer at various breweries) in the Dallas, Texas area. Being from Arizona, I found the Texas brewery laws to be rather silly and restrictive. For example, I found that a brewery, even with a taproom, couldn’t fill growlers or sell packaged beer, but a brewpub was allowed to do so with the trade off being a lower cap on the amount of beer it can brew annually. With that being said, it is no wonder that as of 2014, Arizona has 1.1 craft breweries per capita (100,000 people) while Texas only has 0.6 per capita as calculated by the Brewers Association. What’s the reason for the discrepancy of breweries between Texas and Arizona? In response, you may may ask the question, is there less of a market for Texas craft beer? Hardly, from the same 2014 Brewers Association statistics, Texas produced 1.7 gallons for each adult in Texas over 21 years old, versus 1 gallon per 21 year old in Arizona. I propose that there are more restrictions on breweries in Texas than Arizona, so let’s take a look at a few items, which is not an exhaustive comparison by any means, but only a snapshot. From the list above, it can be seen that for a Texas microbrewery to have similar privileges as a microbrewery in Arizona, it would need to acquire 3 licenses and permits at a higher cost, and cannot self-distribute its beer at all until it receives a permit. Whereas Arizona allows self-distribution with a microbrewery license up to 3000 barrels annually, after which the brewery would have to work with a distributor. At the beginning of 2013, legislation was passed to allow breweries to sell beer for on-site consumption. For Texas brewpubs, this wasn’t a new thing, but the new law gave breweries the choice to do away with the Tour and Tasting model, if they should so choose. The original law stated that a brewery could not sell any beer directly from the brewery for on or off premise consumption. This meant you had to pay around $10 for a tour of the brewery and you would receive a glass for “samples.” Samples were “free,” and these samples (at a typical 16oz pour) were the only way you could try the beer at your local brewery. Tours were limited to a couple of hours (often 1-2 days out of the week) and you were limited on your number of samples. In contrast, late last year I was able to go to 8 breweries within one day during a San Diego beercation because I was able to purchase small tasters of many beers at each location. I’m not the only one to notice that Texas laws are more restrictive than some other states. There is an organization in Texas called Open the Taps, which seeks to change state legislation to remove restrictions on breweries. I wish them the best, and hope that Texas, and all states, will continue to liberalize restrictions on breweries. 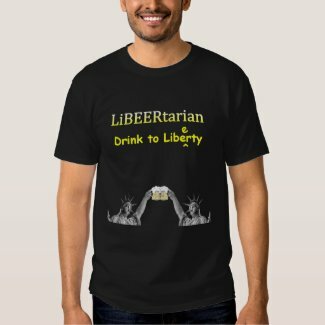 In light of this, I’d like to add my own contribution to the beer and liberty movement with the creation of the “LiBEERtarian” T-shirt. Thanks for stopping by! I sent you a friend request and a message.